Renowned offspring of David, pray for us! Light of Patriarchs, pray for us! Spouse of the Mother of God, pray for us! Chaste guardian of the Virgin, pray for us! Foster father of the Son of God, pray for us! Diligent protector of Christ, pray for us! Head of the Holy Family, pray for us! Joseph most just, pray for us! Joseph most chaste, pray for us! Joseph most prudent, pray for us! Joseph most strong, pray for us! Joseph most obedient, pray for us! Joseph most faithful, pray for us! Mirror of patience, pray for us! Lover of poverty, pray for us! Model of artisans, pray for us! Glory of home life, pray for us! Guardian of virgins, pray for us! Pillar of families, pray for us! Solace of the wretched, pray for us! Hope of the sick, pray for us! Patron of the dying, pray for us! Terror of demons, pray for us! Protector of Holy Church, pray for us! Lamb of God, who take away the sins of the world. Jesus, have mercy on us. He made him the lord of his household. And prince over all his possessions. To thee, O Blessed Joseph, we have recourse in our tribulations, and while imploring the aid of thy most holy Spouse, we confidently invoke thy patronage also. By that love which united thee to the Immaculate Virgin, Mother of God, and by the fatherly affection with which thou didst embrace the Infant Jesus, we humbly beseech thee graciously to regard the inheritance which Jesus Christ purchased with His Blood and to help us in our necessities, by thy powerful intercession. Protect, O most provident Guardian of the Holy Family, the chosen children of Jesus Christ; ward off from us, O most loving Father, all taint of error and corruption; graciously assist us from Heaven, O most power protector, in our struggle with the powers of darkness; and as thou didst once rescue the Child Jesus from imminent peril to His life, so now defend the Holy Church of God from the snares of her enemies and from all adversity. Shield each one of us with thy unceasing patronage that, imitating thy example and sported by thy aid, we may be enabled to live a good life, die a holy death, and secure everlasting happiness in Heaven. Amen. 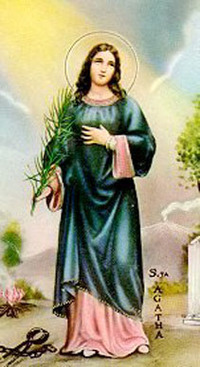 From Catholic Culture: St. Agatha died in defense of her purity, in Catania, Sicily, where she was born. After Quintanus, the governor of Sicily, tried in vain to force her to consent to sin, she was imprisioned for a month with an evil woman. He then turn from sensuality to cruelty and had her breats cut off; but that night Agatha was healed by St. Peter. She was then rolled over sharp stones and burning coals, and finally taken to prison where she died while praying. Her name appears in the Roman Canon. In iconography, Saint Agatha is often shown carrying her breasts on a platter, though later artists thought the breasts to be either bells or loaves of bread, leading to the custom of blessing bread on Saint Agatha's feast day and her patronage of bell makers. Place water, milk, egg, 1/3 cup butter, sugar, salt, flour and yeast in mixer and knead for 7 minutes. Turn dough out onto a lightly floured surface. Divide dough in half. Roll each half into a 12 inch circle, spread 1/4 cup softened butter over entire round. Cut each circle into 8 wedges. Roll wedges starting at wide end; roll gently but tightly. Place point side down on ungreased cookie sheet. Cover with clean kitchen towel and put in a warm place, let rise 1 hour. Meanwhile, preheat oven to 400 degrees F (200 degrees C). …the birds of heaven brought to him meat for to eat. And it seemed to him that they came to serve him and accompany him, and would not depart from him till he had lift up his hands and blessed them. And also sick men came to him and anon were cured and healed. Now it happed that the prince of this region sent his knights to hunt, and they could take nothing. But by adventure they came unto the desert place where S. Blase was, where they found great multitude of beasts which were about him, of whom they could take none, whereof they were all abashed and showed this to their lord, the which anon sent many knights for him, and commanded to bring him and all the christian men with him. And that night Jesu Christ appeared to him thrice, which said to him: Arise up and make to me sacrifice. Lo! here be the knights that come to fetch thee at the commandment of the prince. And the knights said to him: Come out from this place, the president calleth thee. And S. Blase answered: My sons, ye be welcome, I see now well that God hath not forgotten me. He went with them and continually preached, and did many miracles tofore them. There was a woman that had a son dying, in whose throat was a bone of a fish athwart, which estrangled him, and she brought him tofore his feet, praying him that he would make her son whole. And S. Blase put his hand upon him and made his prayer to God that this child, and all they that demanded benefits of health in his name, that they should be holpen and obtain it, and anon he was whole and guerished. Another woman there was that was poor which had a swine, which the wolf had borne away, and she humbly prayed to S. Blase that she might have again her swine. And he began to smile and said: Good woman anger thee not, for thou shalt have again thy swine, and anon the wolf brought again to the woman, which was a widow, her swine. And when this good widow, which by S. Blase had recovered her swine, heard thereof, she slew it, and the head and the feet with a little bread and a candle, she brought to S. Blase, and he thanked God and ate thereof, and he said to her that every year she should offer in his church a candle, and know thou that to thee and to all them that so shall do shall well happen to them, and so she did all her life, and she had much great prosperity. Even after imprisonment, he refused to worship the prince's gods, and for punishment his flesh torn by wool combs. He was finally beheaded, martyred along with seven women and two children. Please stop by Catholic Cuisine to get a few ideas for celebrating the feast of St. John Bosco. In the apparitions to St. Margaret Mary Alacoque, Jesus gives these twelve promises for those who are devoted to His Sacred Heart. "Look at this Heart which has loved men so much, and yet men do not want to love Me in return. Through you My divine Heart wishes to spread its love everywhere on earth." 3. How old was she when her father died? She was 8 years old. 4. What happened when her father died? An aunt moved in to their home. 5. How were Margaret Mary and her mother treated by her aunt? They were made to suffer very much. 6. How did Margaret Mary handle the suffering? She would hide in her garden to cry and pray. 8. What happened when she was 11? She became very sick. 9. How long did her illness last? Her illness lasted 4 years. 10. What happened while she was ill? She developed a devotion to the Blessed Sacrament and decided to enter a convent. 11. What order did she join? The Order of the Visitation. 12. What happened while she lived in the convent? Our Lord began appearing to her. 13. What revelations did she receive? 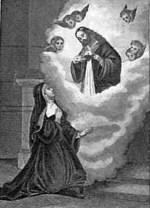 She received revelations of the Sacred Heart. 15. Of what is she the patron saint? She is the patron saint against polio, devotees of the Sacred Heart, loss of parents, and polio patients. St. Teresa of Avila is one our favorite saints. This morning after reading to the kids from Saints for Young Readers for Every Day, I came up with a few questions to help us remember a few important details about her life. 3. What did Teresa and her brother Rodrigo love to read when they were young? The lives of the saints and martyrs. 4. What did the two children secretly set out to do? To go to the land of the Moors. 5. What else did they decide to do? They decided to become hermits in their garden. 6. Were they able to do this? No. They could not get enough stones together to build their huts. 7. What happened to Teresa when she became a teenager? She changed and became worldy. 8. Why did this happen? She read many novels and foolish romances and she lost her love of prayer. 9. What did she think about then? She began to think about dressing up to look pretty. 10. What happened after she recovered from a bad illness? She read a book about the great St. Gerome and made up her mind to become a bride of Christ. 12. What did she do with the help of St. John of the Cross and Peter of Alcantara? She reformed most of the Carmelite convents in Spain and founded a few new ones. 13. What spiritual books did she write? 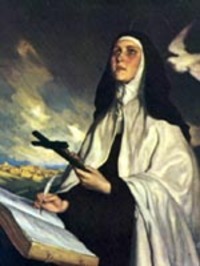 The Autobiography of St. Teresa of Avila: The Life of St. Teresa of Jesus, The Way of Perfection, and Interior Castle. 15. What was she declared in the church? The first woman Doctor of the Church. 16. Of what is she the patron saint? Headaches, loss of parents, Spain. In honor of the feast of St. Teresa of Avila, we are going to make and St.Teresa’s Bread for breakfast and Paella for dinner. This dish, which makes a tasty breakfast or branch, is a first cousin to French toast, but with a flavor and texture all its own. Combine the milk with the sugar, cinnamon, and lemon peel. Simmer gently for 5 to 10 minutes, until the milk has become well flavored. Place the bread in a large flat dish or pan, and strain the milk over it. Beat the eggs in a shallow bowl with a pinch of salt. With a spatula, lay the slices of bread in the egg, turning them to coat both sides. Beat additional eggs and salt together if necessary to finish coating bread slices. Fry the bread in the olive oil until it is browned and crusty on both sides. Heat a wok over medium-high heat. Fry Italian sausage pieces in the pan until brown on all sides. Remove sausage, and fry the chicken strips in the sausage drippings until browned. Remove chicken and saute onions, green pepper, celery, and garlic for 5 minutes, or until tender. Stir in the uncooked rice, tomatoes, bay leaves, salt, oregano and turmeric. Cook and stir for 1 minute, then mix in the reserved tomato juice and chicken broth. Add chicken pieces, cover and simmer for about 20 minutes. Add sausage to the mixture, and continue to simmer for 15 minutes, then stir in the shrimp; cover and cook for 5 to 10 more minutes, or until shrimp is cooked through.